You may have noticed over the past few months we have been making some exciting announcements regarding our new development launches across Yorkshire and Derbyshire. To keep things simple we’ve compiled all the information you need to know about our brand new Ethos, Identity, Expression and Definition developments into one handy blog post. So let’s get started with our stunning new development in Mackworth. Located on the old Mackworth college sports field and only 2.6 miles from Derby city centre, Definition will be the perfect spot for commuters and young professionals to set up home. With 221 new homes available, Definition is the largest of our new developments and will offer a friendly neighbourhood and community feel. With stunning woodlands situated right next to the development as well as open fields and the Peak District a mere half an hour away, you will have the beauty of Derbyshire right on your doorstep. Next up is our Identity development in Bramley located just four miles from Rotherham city centre on the site of the old Wadsworth Road bus depot. Situated on a main bus route that will take you into the heart of Rotherham, you will also be able to take advantage of the nearby restaurants, shops, pubs and supermarkets. There are five different house types on offer spread over 49 lots ranging from detached to semi-detached, so if it’s more space you’re after or a first family home, Identity could be the ideal fit for you. If it’s a more rural spot you’re after, why not have a look at our Expression development located in Midway. This quieter location is just a short drive from Swadlincote but still within easy commuting distance of cities such as Derby, Loughborough, Burton-On-Trent and Nottingham. The development is close to a number of parks as well as primary and secondary schools. Enjoy the fresh air and green space of country side living while still being close to restaurants, shops and other amenities. There’s even a local ski and snowboard centre! With a wide range of house types on offer at Expression there’s one to fit every walk of life, whether it’s young couples or those after a family home. There are 66 brand new homes waiting to be occupied so make sure you don’t miss out! Last up we have our Ethos development and for the first time in Strata history we are coming to Nottingham. Located on Edwards Lane in the Sherwood Dales area, Ethos offers 10 different house types only one mile from the town of Arnold and three miles from Nottingham. Perfect for those wanting the peace of the suburbs but close enough to enjoy the buzz of the city. Ethos offers great public transport links into Nottingham centre which is bursting with restaurants, shops, art galleries and live music venues. East Midlands Airport is only 17 miles away and the historic Sherwood Forest is an hour by car. 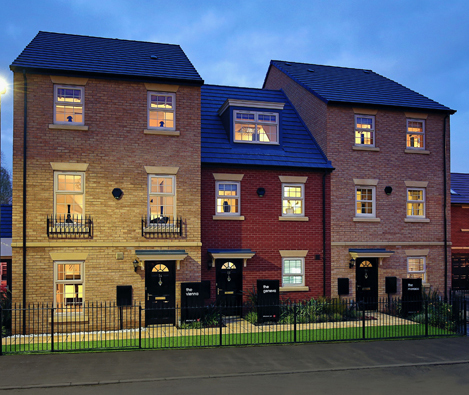 Offering two to four bedroom properties, Ethos could be the perfect place to call home. If you are interested in any of our new developments be sure to get in touch and register for our early bird scheme to reserve your plot today.